Jeep® Wrangler feautres the most comfortable interior in its class. You’ll enjoy seats in premium Sedoso cloth or McKinley leather trim with embroidered stitching. Jeep® Wrangler also provides the benifit of available heated front seating, illuminated cup holders and more. Comes with black upper and lower instrument panel. 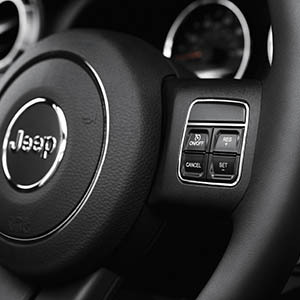 Jeep® Wrangler features a rugged yet refined interior with many unexpected comfort and convenience features, which include available heated, leather-trimmed front seats and illuminated cup holders. This new color is an exclusive for the Jeep® Wrangler Sahara trim. It comes with a black upper and lower instrument panel. The available olive green leather-trimmed bucket seats include an embroidered Sahara logo on the seatback. Comes with Black upper and dark saddle lower instrument panel. Sedoso cloth seats with Rivet cloth inserts come in black with dark saddle accent stitching and blend nicely with the black upper and lower instrument panel. Comes with black upper and lower instrument panel. Sedoso cloth seats with Jeep® hex cloth inserts are black and match the black upper and lower instrument panel. washable interior with drain plugs. So go ahead and indulge in some good, not-so-clean fun. Wrangler has a wide storage space with its fold-and-tumble seats. Your valuables are secure thanks to a center console and lockable easy-access storage bin with a dual-stage lid tray. Inside the 2017 Wrangler, you’ll enjoy ample storage space, thoughtfully designed ergonomics and noise, vibration and harshness protection.